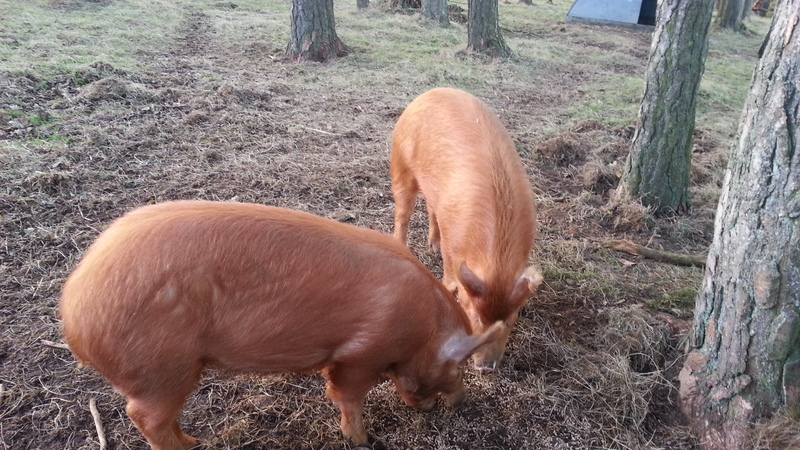 Their last week is here and everything appears to be in place for the pigs trip to the abattoir on Sunday. There are just 2 main tasks left to complete before they head off. We need to ear tag them as required by the regulations and register the animal movement from our holding to the abattoir. Both of these seem to be fairly straight forward (if you don’t mind sticking a metal tag through a pigs ear with a set of pliers) but I’ll be checking things again ahead of time just to be sure I’ve not missed anything. I’m still not sure that we’re completely clear about how much pork will come back from these two pigs but hopefully we won’t get sick of eating pork anytime soon! One interesting aspect for me is that I am not (yet) quite as upset as I had expected especially given that these pigs have been such characters and were absolutely no bother to look after. They have certainly enjoyed their home in the woods and we have got a great deal of entertainment from watching their antics as they settled into life here. There is no room for sentiment though, we got these animals to raise for meat and this is all part of the process. If any distraction is needed then there is always the thought of getting a couple more weaners next year to repeat the whole exercise. The measurements and weight calculations have been more regular in recent weeks but are still only a rough guide. The difference between the two pigs is very surprising to me and I will be very interested to see what feedback (if any) we get from the abattoir people. One lesson learned – I would not recommend the cheaper manual mincers and I’m happy that the price of our new electric machine will be money well spent in the long run.